NORTHERN Knights and Greater Western Victoria (GWV) Rebels’ victories have seen them rewarded with the most nominees in the AFL Draft Central TAC Cup Girls Team of the Week for round seven. The Knights had a 71-point victory over Bendigo Pioneers, while the Rebels just got home in a thriller against the Murray Bushrangers, but both had some standout players, particularly up forward. The other four winning teams, as well as Gippsland Power and Western Jets also had two nominees, while the Bendigo Pioneers, Calder Cannons, Bushrangers and Oakleigh Chargers all had the one nominee for the week. It was a tough call this round with so many midfielders and forwards putting their hand up. So much so, that GWV Rebels midfielder Sophie Molan slipped onto a half-back flank, a role she has played at times throughout the season, to fit them in. GWV Rebels most consistent trio of Molan, Sophie Van De Heuvel and Georgia Clarke made the side this week, with Clarke’s efforts at centre half-back and Van De Heuvel’s work through the mid-forward region earning them spots in the 22 with Molan. For the Knights, they had no shortage of firepower up front, with Britney Gutknecht (six goals), Ellie McKenzie (three) and Jess Fitzgerald (two) causing all sorts of headaches for the Pioneers, and therefore earned spots in the Team of the Week. The likes of Knights’ defender Olivia Dikranis and Rebels’ captain Lauren Butler were also considered, but just missed out. Jazz Ferguson made her debut in the Team of the Week after a number of close calls, chosen as starting ruck for the team this round, while teammate and Power co-captain Tyla Hanks made it six teams from six games played, once again named in the 22. 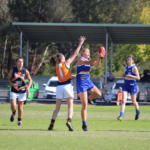 Eastern Ranges’ exciting mid-forward Gabriella De Angelis also made the side, as did her teammate and Ranges’ co-captain Emerson Woods, who slots onto a wing for her performance on the weekend. On the other wing is Geelong Falcons star Nina Morrison, named in the team with Sophie Walmsley, who booted two goals playing midfield and forward; named at centre-half forward for her height in a team littered with talented mid-forwards. Rounding out the starting midfield was Calder Cannons’ captain Madison Prespakis, who like Hanks, has been named in the team every week she has played. 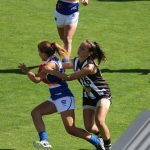 Tough inside midfielder Chelsea Knight made the side for her efforts in the Bushrangers’ defeat, with Kate Adams and Tamara Smith others considered unlucky not to have squeezed in, for what was truly a team performance. Bendigo Pioneers’ midfielder Kodi Jacques has been no stranger to making the Team of the Week, named her side’s best once again, as was ruck Bridie Winbanks, with the Chargers’ tall rotating with Ferguson in this team. Forward Melanie Bertuna was also considered for Team of the Week, but just missed out. The Dandenong Stingrays have been known for their strong defence, and it is no surprise to see two defenders made the team this week after a great win over Oakleigh. AFLW Academy member and Stingrays’ captain Jordyn Allen made the side once again, as did running machine Shelley Heath. In the other back pocket was Alice Burke who made the team for the second time this season, in the starting 18 with her teammate Holly Bate who booted five goals for the Sandringham Dragons in their win over the Western Jets. Speaking of the Jets, key defender Isabelle Pritchard made the side for the third time this season, locking down full-back, with the consistent Elisabeth Georgostathis named on the bench. ROUND seven confirmed the two grand finalists for the TAC Cup Girls competition. The Geelong Falcons and Northern Knights have now won seven games in a row, and sit two games ahead of Sandringham and Eastern at third and fourth (respectively). All four teams had a win on the weekend and were joined by Greater Western Victoria (GWV) and Dandenong on the winners’ list. The Greater Western Victoria (GWV) Rebels continued their fantastic form with their third straight win, following a thrilling six-point victory over the Murray Bushrangers. 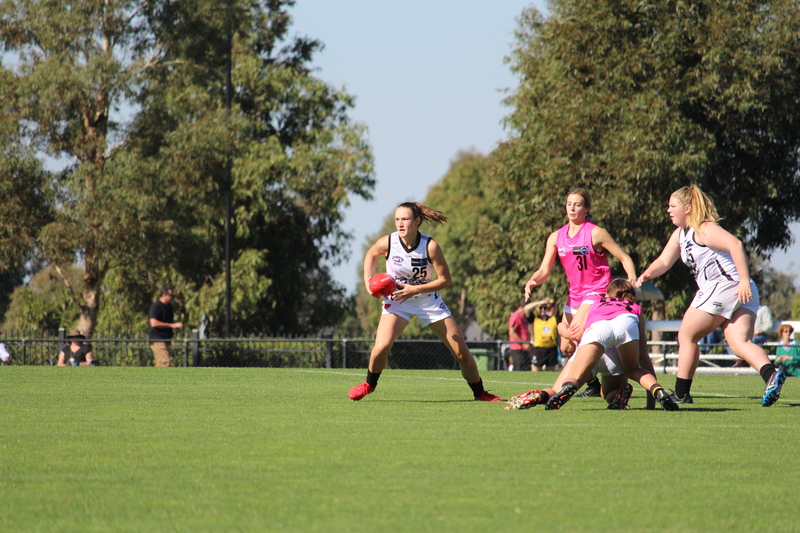 The Bushrangers have found themselves on the opposite side of the formline, with the loss making it three consecutive defeats since going nine games without a loss in the first season and a half of TAC Cup Girls football. 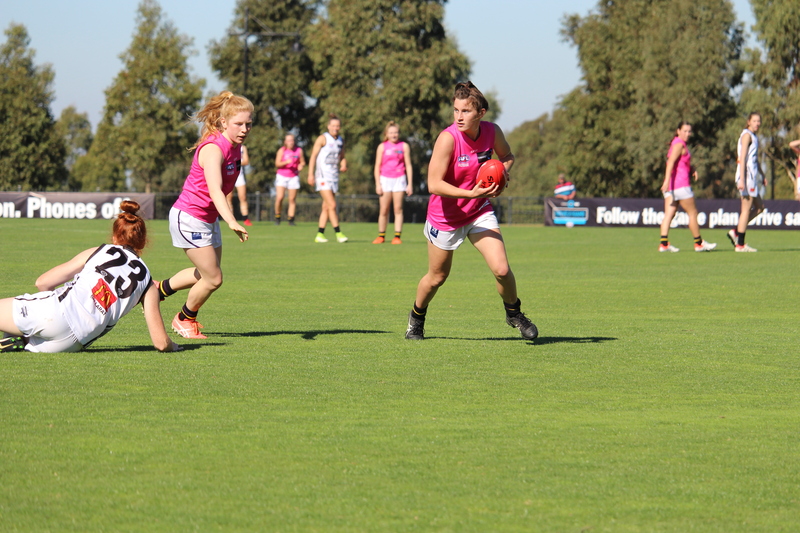 Both sides were impressive throughout with a number of AFLW Academy stars putting on a show. For the winners, Georgia Clarke was immense at centre-half back in the first half, rebounding all the Murray attacks, while up the other end, Sophie Van De Heuvel booted two goals and could have had a couple more had it not been for a few unlucky misses, or unselfish plays. Sophie Molan continued her fantastic form through the midfield and around the ground, while up forward, the exciting Renee Saulitis booted a goal and almost had a second, just looking dangerous every time she went near it. Captain Lauren Butler was another consistent player across four quarters playing all across the ground. 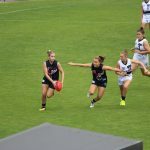 The Bushrangers’ midfield was the shining loss in the defeat, with Rebecca Webster leading the way despite being closely watched by her opponents, while Tamara Smith, Chelsea Knight and Millie Brown all threw themselves into the contest. Kate Adams was lively between midfield and forward, while Grace Egan was solid off half-back, producing some good rebounds and run-and-carry. The Dandenong Stingrays backed up their first win of the season last week with a clinical 28-point win over the Oakleigh Chargers. The Stingrays led all day but in a positive for the Chargers, they outscored the away side by a point in the last quarter. Alice O’Sullivan was the best afield for the Stingrays and was joined by usual suspect, Jordyn Allen among the top Dandenong players. The Stingrays captain has been a consistent performer in the back line all season and Saturday was no different. Isabella Shannon backed up her two-goal performance last week with another two goals against the Chargers. Amie Carroll was one of seven goal-kickers for the Stingrays, and also found her name in the best for the away side. Playing without last week’s best-on-ground, Katie Lynch was always going to be a big challenge for Oakleigh. But the Chargers had plenty of players who stepped up in her place, including Chloe O’Malley, Melanie Bertuna and captain, Hannah McLaren. Bridie Winbanks was named the best player for Oakleigh after having another dominant performance in the black and white. Cricketer Isabella Gietzmann got on the board with a goal and also featured among Oakleigh’s best. In a close encounter, it was the Eastern Ranges that came away with a nine-point win over the Gippsland Power. Both teams brought their a-game and competed hard throughout the game, with plenty of good match-ups across the ground. The Power threw everything at the Ranges in the last quarter but the Ranges showed great composure and held on to claim their fifth win for the season. For the Ranges, Emerson Woods impressed both in the air and at ground level, going in hard to win the footy. Woods took a few good strong marks and consistently provided an option for her teammates. Nicole Cormack also played a big role in the Ranges win, slotting an important goal in the dying minutes to help secure the victory for Eastern. Georgia Macpherson applied plenty of pressure and was clean in and around the contest while Catherine Chamberlain imposed herself on the scoreboard, slotting a major. Tyla Hanks was in impressive form yet again for the Power, slotting a big goal to keep them in the game and racking up plenty of touches. Her ability to read the play allowed her to release her teammates into space and propel her team forward. Jazz Ferguson also had a stellar game for the Power, laying plenty of strong tackles and taking a heap of intercept marks. Ferguson was really strong around the contest and showed her clean hands in tight. Emily Haeusler was in fine form once again winning plenty of the footy while teammate Chelsea Bray slotted an important goal for the Power. Sandringham kept the Western Jets goalless until late in the last quarter, making more noise on the ground than ever before and proving it near impossible for the Jets to get the ball- not just into their attacking 50, but across the halfway line. Nobody could get near Dragons forward Holly Bate, who kicked five majors for the day while Kaitlyn O’Keefe kicked the only goal for the Jets late in the last quarter. Midfielder, Eliza McNamara was among the standouts on the weekend, continuing to show how much of an asset she is to the Dragons line-up. Alice Burke and Bryanna Arnold stood up in defence and had solid performances. But it was Holly Bate who stole the show for Sandringham, kicking five goals in a dominant performance inside 50. Abbie McKay also got on the board with two majors, and was named among the Dragons’ best players. For the Jets, Elisabeth Georgostathis had another fine day through the middle of the ground and never gave up throughout the match. Isabelle Pritchard was solid once again in defence and continues to trouble opposition forwards. Cleo Saxon-Jones had another commendable performance while Isabella Grant found her name in Western’s best once again, proving how valuable she is to the side. After an even first quarter, it was all the Knights from then on as they piled on 12 goals to two to stay undefeated after seven rounds. At quarter time, the match could have gone either way, but the Knights flicked the switch and kicked five goals to none in the second term to give themselves a game winning 35-point lead at half time. Britney Gutknecht was enormous with six goals, jumping to second on the league’s top goal kickers list. Ellie McKenzie was influential in the middle of the ground, and was assisted by Neve O’Connor dominating the ruck and getting plenty of hit-outs throughout the game. Kodi Jacques was clearly the best for the Pioneers, digging in deep in the midfield all day while also kicking a goal. Captain, Megan Williamson and Dayna Kelly-Guthrie were among the other leading performers for the Pioneers. The Knights will look to claim top spot in round eight against Geelong Falcons in a top-of-the-table clash, while Bendigo will face another tough game against third-placed Sandringham. At the end of the first quarter, the Cannons were leading the Falcons, prompting them to go bang with a six-goal second quarter. Calder fought back in the third quarter with three goals but Geelong’s second quarter was dominant enough to secure the victory at RAMS Arena. Sophie Walmsley had a dominant performance for the Falcons, kicking two goals for the day and having a strong presence around the ground. Ella Mahoney also got on the board with two majors in her first game of the season. Nina Morrison continued her stellar season in the midfield with a high work ethic throughout the match, and was complemented by Zoe Inei in the ruck. Madison Prespakis again starred for the Cannons, playing in the midfield and contributing at full forward. Prespakis kicked two goals for the day and her on-field leadership was second-to-none. Carla Rendelmann starred in the ruck and absolutely dominated, winning plenty of hit-outs. Midfielders, Felicity Theodore and Grace Dicker were among the best for the Cannons, providing important run throughout the day. WITH the AFLW Academy stars out of TAC Cup Girls action this week, it will undoubtedly be a test of depth for all sides across the board. Headlining the round five action is the battle between two undefeated teams in Murray and Geelong. This will be the last of a triple-header at Bendigo in what is set to be a huge day, and round, of TAC Cup Girls football. In the first true home match for the Jets, they go into the game relatively unscathed with Isabella Grant being the only AFLW Academy member for Western. But they come up against the Eastern Ranges who remain undefeated after four rounds of TAC Cup Girls football. This will be an opportunity for Western’s defence to mimic the efforts of the Pioneers last week, who kept Eastern to four goals. Katarina Rebuffo has been one of the standouts for the Jets this season and could play a big role on the weekend. Caitlin Greiser has been named in the ruck, but could assert her dominance up forward after being the sole goal-kicker for the Jets last round. For the Eastern Ranges who have to travel to the other side of town, it will no doubt be a big test for them to get a win. Although they are undefeated, Western is hungry for a victory and Eastern’s depth will have to match the pace of the young Jets. The Ranges can trust in Lauren Szigeti who played a wonderful game against Bendigo in defence. They will also have the speedy Mikala Cann in the midfield to provide some inside run and speed. This will be an intriguing battle between two young sides. The Pioneers boast the likes of Megan Williamson and Kodi Jacques in the midfield while the Power have plenty of depth to fill Tyla Hanks’ absence this week. Co-captain Amy Dunn will have the opportunity to take the reigns on her own at Epsom and will undoubtedly be complemented by Jazz Ferguson and Alana Rippon, who have been among Gippsland’s best players each week. The Power also have a strong defensive set-up this week with Julia Redmond and Emily Haeusler floating across half-back. Bendigo comes into the game with an unchanged side after restricting top side Eastern Ranges to just four goals last week. Keep an eye out for Jemma Finning and Maddie Baldwin who have been playing some wonderful footy for the Pioneers. Kate Douglass has been outstanding in defence and will look to minimise the impact of Chandra Abrahams and Nikia Webber, who booted two goals in a row last week in a match-winning performance. All eyes will be on Oakleigh in this game as gun players Hannah McLaren and Gemma Lagioia will sit out the match at Preston this week after being involved in a head clash in round four. The story is not any better for the Knights as they will be without versatile leader, Gabby Newton who is in the AFLW Academy. However Northern has a strong line-up of players and they will certainly step up in Newton’s absence. Abigail Bennett played another stellar game last week and would be keen to get on the scoreboard in this match, starting on the half-forward flank. A key name on the team sheet is Ellie McKenzie in the midfield. McKenzie has been playing fantastic in defence since her round three debut, and will be tested against Oakleigh’s Alana Porter and Mimi Hill . One of the biggest ins for the Chargers is star midfielder, Katie Lynch who will undoubtedly provide some firepower through the middle of the ground. Lynch was one of the best performers in her last TAC Cup game in round three and she is likely to be up there again at Preston. Daisy Bateman and Melanie Bertuna also come into the side and will be looking to tear it up in the forward-line against a formidable Northern backline. In the second game of a triple-header at Bendigo, the Stingrays and the Rebels will go head-to-head with some key players missing from the game. 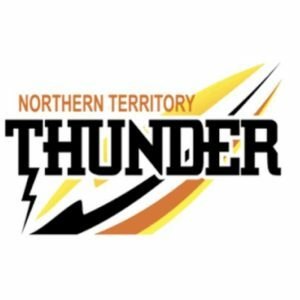 For Dandenong, Jordyn Allen, Courtney Jones and Brooke Struylaart will sit out the round five clash while Sophie Van De Huevel, Rene Caris and Georgia Clarke will watch from the sidelines for Greater Western Victoria (GWV). But the Rebels still have plenty of firepower in their side, with Lauren Butler likely to dominate in the midfield. Nyakoat Dojiok has hardly put a foot wrong this season and will be looking to put the pressure on the Stingrays with her pace. Sophie Molan will also be a huge presence in the midfield alongside Butler and Dojiok, getting shifted there in the absence of Caris in the ruck. Shelley Heath will line up for the Stingrays in the midfield as she always does and could go head-to-head with the likes of Butler and Molan, which should be an intriguing battle. Also keep an eye out for Eloise Allen-Burns and Lucinda Cripps, who have been as consistent as ever in defence. Samantha Ryan will start at full-forward for the Stingrays and will be hungry to kick some goals to lead her side to their first win of the season. The Sandringham Dragons are arguably one of the strongest sides going into this round with no AFLW Academy absentees holding them back. It is a different story for the Cannons though as captain, Madison Prespakis as well as Georgia Patrikios and Molly Warburton will have to sit out the match. Prespakis has been Calder’s best player in pretty much every match they have played this season so her loss will be a massive test for the Cannons. To soften the blow of her absence, the Cannons have the speed and acceleration of Grace Dicker as well as the endurance of Faith Holloway to provide some run through the middle of the ground. Zoe Hardiman will line up forward alongside Georgia Marsland, who was proactive inside 50 last week. But Hardiman and Marsland could have a battle on their hands with Sarah Hartwig, Alice Burke and Laura Amelung in great form across the back-line. Eliza McNamara and Jasmine Tait will look to nullify the impact of Dicker and Holloway in the midfield, and could also float around the ground to add some versatility to the Dragons line-up. Jemma Owen played a true captain’s game against Dandenong and will be looking to lead her side to a win at home. Round five has saved the best until last with two undefeated teams going head-to-head at Epsom. But both teams have quite a lengthy list of outs. Geelong will be without Lucy McEvoy, Olivia Purcell, Denby Taylor, Eliza Shannon and Nina Morrison. The Bushrangers will be without Rebecca Webster, Eloise Ashley-Cooper and Millie Brown. But Murray still has star player Grace Egan, who will start forward after playing in defence throughout the season. Julia Harvey and Tamara Smith will also still be running around for the Bushrangers, and will be looking to continue their red-hot form against Geelong. Chelsea Knight and Sophie Damon will be key players in the midfield as they aim to combat the Falcons who are fresh off a 70-point victory. Despite the absence of five key players, Geelong’s side still looks strong as Sophie Walmsley, Paige Sheppard and Tarryn Love headline the midfield. Abbey Chapman and Mia Sheppard will look to hold down the fort in defence in the absence of Denby Taylor. The Geelong forward-line is still strong with Sachi DeGiacomi dominating at half-forward while Renee Tierney is coming off a four-goal performance last week.